5 Recovery Lessons Learned from My 6-Year-Old - Full Potential, Now! 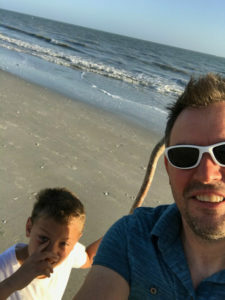 I was recently on the beach in Sannibel, Florida with my 6-year-old son, Samuel. I became enthralled one morning watching him draw lines in the sand with a big stick that he found on the beach. A stick I would of simply walked by. As I watched him draw this long line in the sand, I became keenly aware of how oblivious he was to the things around him. He was so focused on drawing that path through the sand, making it the most challenging line to walk. There were people around him, some even watching, but he did not notice, because he was so into watching the line form as he walked along. Waves from the ocean made his feet wet, and at one point, he almost walked right into some people strolling along the beach so busy with his lines in the sand. I laughed, wondering in amazement on his focus, and how much fun he was having. It made me contemplate my own life, and what things I focus on and what things do I have fun with. So much so that I lost track of time and my surroundings. Do I own a stick in life that commands my focus, energy and laughter? That could lead me down a path? To be honest, as I reflected, I could see that I may have lost my way a bit. I find it difficult at times to have a relaxed, focused, fun and positive attitude in what I am doing in the moment. Maybe as adults, we get too distracted and begin to worry about too many things to get back to this state of mind and state of wonderment. We drop our stick, think in circles and end up staying in the same place. My thoughts then shifted to the thousands of people in recovery I have worked with: their struggles I’ve heard, the changes they were able to make people, the roadblocks they hit and their successful strategies to remain sober. I thought of the people who had fun while in recovery, laughing and loving their way sober, one day at a time. Then it struck me… the common ground between a person living a successful recovery and my 6-year-old on the beach. Or maybe we will call it the beach of life. 1. Get a stick, and start drawing your recovery line on the beach of life. Just as Samuel drew a short beginning line in the sand to start his journey, he also drew a longer line over time. The longer line appeared to be more successful as he encountered the waves rolling into the sand, and he was able to improvise, making changes in his approach. I was struck by how quickly he was able to learn from his mistakes – shame or guilt free – and just move on to a different approach. I became, I think, envious at one point when I thought about some of my own struggles in dealing with relationships, friends and family. At times, I stayed so stuck in the same approach that in retrospect was just perpetuating more of the same. As I watched Samuel, he began to mark out new territories to make the line that much better and that much more protected from the waves of the ocean. He seemed so wide open to possibilities at the time and found better routes to draw the line. 2. Be open and free in how you draw it; keep possibilities and new ways of doing things in the forefront. Samuel was uninhibited in his approaches, laughing and talking. Screaming “yeah!” freely out on the beach. However, he was not without mistakes; ocean waves swallowing his lines at times, or sea shells blocking his path.The key in all of this was Samuel’s approach: he became aware of his mistakes, and developed a new strategy. The amazing thing was that he appeared to be shame-free in his mistakes and felt free to explore other avenues of line-making. I began to think about “his line” and the recovery “line” so many people try to make. The beginning recovery line-maker, verses the middle recovery line-maker, verses the late recovery line-maker. The struggles, successes, obstacles and battles of faith people in recovery will have with themselves over and over again. Samuel didn’t worry too much about getting his feet wet as waves crashed the shore. 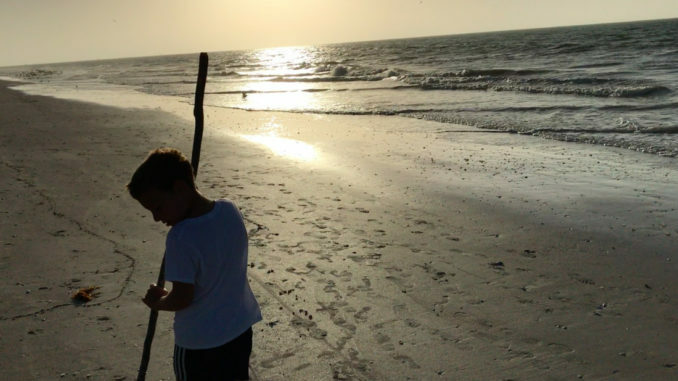 He is intent on drawing the line in the sand with his “stick.” It was like a tool that guided him in some ways and that he had confidence in and that he could use to guide him. Then it struck me again, the people in recovery I met that were successful all had a tool – a stick on the beach – they used to fight off cravings, or thoughts of drinking or drugging. Their “stick” was a favorite friend in AA/NA, a family member that would support them, a AA/NA group where they felt comfortable expressing themselves, a recovery podcast they listened to that provided inspiration, an online meeting, a favorite activity they did to help guide them down the road of sobriety rather than relapse. 3. Don’t worry about being perfect; acceptance of imperfection is a key ingredient in a great recovery. As I listened to thousands of stories about recovery and relapse, it was those who had tools for their recovery and used those tools to draw their line on the sandy beach that led to success. It was not perfect by any stretch. The ocean waves wiped out some of their line, but they were diligent in getting back to the things that made them successful. That was the common factor I saw over and over again. Simply put, they had a recovery stick they had faith in, and they drew their line. They did not sit down in the sand and give up, but instead got into action. Even when the line faded or was washed over, they were able to go back to their stick and redo a line, or draw a different line headed out in a different direction. 4. Stay in the moment and embrace the unknown with a new sense of adventure. They also realized the line of recovery is being created by them in the moment and that there is an unknown involved in this process. Just as Samuel decided to have twists and turns and downs and ups, a person’s recovery direction also has unknown elements to it. There is a willingness to venture into the unknown and have a stick to lay in the sand. There is actually a certain freedom, creativity and flexibility that aids in having a happy recovery. They are also willing to take take on the challenge of what the unknown of a sober life could look like. Some people might draw that line close to the ocean, while others might do some of that and then draw it up on the beach as they don’t tolerate the cold ocean water as well. Others like the water, so they draw their line around the waterline. Everybody’s recovery is individual, and they need a direction on the sand of life. There maybe passersby that influences where the line goes, but ultimately it is an individual path to be determined by that individual. The key is a willingness to try different things; to use action to create new potential outcomes. 5. Become aware of factors that influence what line is drawn. As Samuel noticed the power of the ocean washing his line away, he made revisions and changes. He did not keep drawing the same line, doing it the same way and having his line washed away. Do the same for your recovery. Don’t have your recovery washed away by doing something over and over again that does not work for you. Like hanging out in the same old situations or same old using friends. If it is the 3rd time you’re trying to draw your recovery line, you might add some new elements. You might add additional AA/NA meetings, make sure you do more lunches or coffee with positive friends, or talk more with your sponsor. Try some new twists and turns, which may change the process a bit, but ultimately lead to a new outcome and make that line stand the test of time. We all know the popular definition of insanity all too well: continuing to do the same thing over and expecting different results. In recovery, this is a crucial element to your recovery line. If you have been successful with your line for 100 or 200 yards without it being washed away by the ocean, why not follow that same path, but divert at the 200 yard mark? Maybe even find someone who has drawn a line 400 yards out to see if it relates to you. There are certain basics and fundamentals that lead people down the sobriety line for 90 days, but what needs to happen if you see your line always getting washed up after 90 days? Young Samuel saw how his line got washed up by the ocean if he got too close. He decided to change his strategy and change his line, drawing it away from the ocean. Get the sand out of your eyes….start to draw your line in the sand! Get a stick and start drawing your recovery line on the beach of life. Don’t worry about being perfect; Imperfection and your acceptance of your own imperfection is a key ingredient to a great recovery. Stay in the moment and embrace the unknown sober life with a new sense of adventure. Become aware of the factors that influence what line is drawn. What tools do you need to draw your recovery line? What would your recovery line look like? How do you stay naturally curious and open to possibilities? How do you embrace your imperfections and use these imperfections to motivate the movement of your recovery line? How do you not worry so much about what others say? Go for what is good for you. How do you embrace the “unknown” of sobriety? Where has your line gone so far and how can you add to it and not make the same mistakes? Here is your stick, your sand and ocean. Now go for it! Great blog, Ted! Amazing insights.